Hyperbaric oxygen therapy consists of breathing 100% oxygen while inside a therapy chamber. The chamber is compressed to a pressure higher than you are breathing now and can increase oxygen levels in your body up to 15 times. 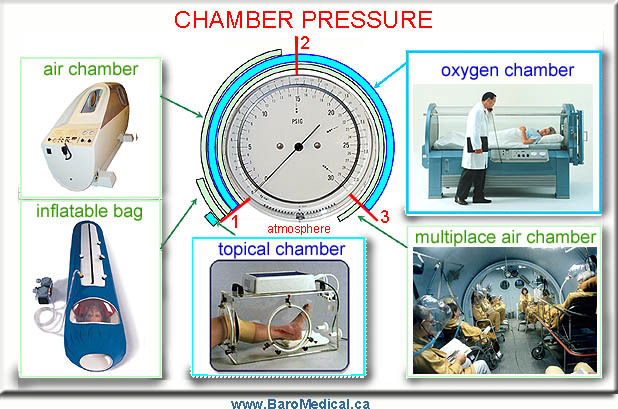 Hyperbaric chambers range in size and operational principles. Smaller units provide individualized therapy whereas larger hospital settings can treat a dozen or more patients simultaneously. Research in hyperbaric medicine is generally performed with 90 min of oxygen exposure at pressures ranging from 2.0 to 3.0 atmosphere (ATA) or 27 to 41 psi. Therapeutic momentum is maintained with daily sessions. There are two ways of increasing the pressure inside a hyperbaric chamber. Compressing a hyperbaric chamber with pure medical grade oxygen provides the most efficient, safe and comfortable treatment. Oxygen flows through the chamber at a rate of up to 500 liters/min. Continuously replenishing the inside atmosphere assures a clean oxygen environment with a well controlled temperature. Oxygen is absorbed through both lungs and skin for maximum therapy efficiency. This can reduce the overall number of therapy sessions required. The most comfortable oxygen flow-through chambers are made of special clear acrylic glass allowing full view of your surroundings. These are ideal for people having issues with confinement anxiety. In an oxygen flow-through chamber nitrogen does not present a risk of decompression sickness when the therapy ends. Alternatively, the chamber can be compressed with air and oxygen is inhaled through a mask or a hood. Oxygen is now absorbed almost exclusively through the lungs while the skin is exposed to excessive high concentrations of nitrogen. The “oxygen therapy” does not start until the mask or hood is applied with a sufficient oxygen flow (>15 l/min). Breathing compressed air inside the chamber exposes the patient to undesirably high concentrations of nitrogen effectively diluting the oxygen therapy (ref). This makes the air filled chambers less efficient than the oxygen chambers. The total therapy time is therefore usually longer and more sessions are needed to achieve results comparable to the oxygen chamber. Air compressed chambers come in a variety of sizes and shapes with larger “multiplace” chambers being the hospital standard. They allow for specially trained health care professionals to attend patients inside the chamber. As the air inside the chamber is compressed the environment becomes warm and humid with a potential risk of bacterial buildup and patient cross contamination. This mandates strict chamber cleaning procedures and careful screening of the patients. Reducing the air pressure at the end of therapy has to be done carefully to minimize the risk of developing decompression sickness. Monoplace are designed for single person breathing oxygen from a mask or a hood. The chamber wall is steel with port windows for external view and can either have a cockpit style reclined seat or a stretcher for laying down completely. The operating pressure is typically limited to less than 14.7 psi above standard atmospheric pressure (2 ATA). Some air compressed chamber types carrying a Health Canada Medical Device License can reach pressures up to 3 ATA. Those will have to comply with certification requirements by PVHO standards (Pressure Vessel for Human Occupancy). Oxygen is inhaled through a mask or a hood with a neck seal and the therapy time counts only during oxygen breathing. See more below. Operators have to be trained and certified as hyperbaric technicians (CHT). Monoplace are designed for full oxygen exposure of one person. These chambers are typically made of large clear double cylinders Plexiglass tubes allowing full in and outside view. The operating pressure is limited to 3 ATA or 29.4 psi above atmospheric pressure as safe and efficient maximum oxygen exposure. The chamber requires chamber certification according to PVHO standards (Pressure Vessel for Human Occupancy) as well as Health Canada Medical Device License. These chambers offers the most efficient oxygen therapy by delivering oxygen systemically through the lungs and through the skin. In comparison, therapy in air compressed chamber will exposed the skin to high concentration of nitrogen given its 80-20 percentage ratio of nitrogen and oxygen. Inflatable Bag: This technology found its way from mountaineering sports where it was used for sleeping at altitudes in close to normal oxygen conditions to prevent altitude sickness. Among hyperbaricists it is called “mild hyperbaric”, given its limitations in treatment pressure. It is compressed with air or oxygen enriched air with maximum pressure limited by fabric and closing device – typically 2 to 3 psi above standard atmospheric pressure (~1.2 ATA). Having such low operating pressure, bags currently do not have to comply with certification requirements by PVHO standards (Pressure Vessel for Human Occupancy) and can be used in small scale offices and homes, provided that the operators have obtained proper knowledge to safely operate pressurized equipment designed for therapy. Topical chambers: An acrylic box with an opening for an arm or a leg to extend into a pressurized chamber. A tight rubber seal around the extremity allows the box to maintain a very modest increase in pressure inside. The box is filled with oxygen or oxygen enriched air however the maximum pressure is limited by the constricting body seal. Unfortunately this reduces blood flow to the limb thereby counteracting the therapeutic effect of the therapy. Typically the maximum pressure is less than 1 psi above standard atmospheric pressure making it a total of only 1.07 ATA. As implied by the name a “topical” chamber only exposes the surface of the skin to oxygen. This severely limits the amount oxygen that can be delivered to the body. Furthermore a dry wound surface is fairly impermeable to oxygen thus rendering the therapy even less efficient. A Multiplace Chamber typically has the capability to reach pressures beyond up to 6 ATA for acute treatment of decompression sickness in divers. This requires the chambers to comply with strict safety guidelines by PVHO standards (Pressure Vessel for Human Occupancy) as well as Health Canada Medical Device License. Given that multiple people share a relatively confined space these chambers require careful cleaning procedures and patient screening to minimize risk of cross contamination of infectious diseases. The only external gas source for oxygen compressed chambers is oxygen and as such it maximizes the potential absorption of oxygen. Exposing both lungs and skin to oxygen provides the fastest and most efficient way of increasing oxygen concentration in the body (ref). By virtue of its operating principal oxygen compressed chambers eliminates exposure to gases other than oxygen. Nitrogen exposure is a concern in air filled chambers where additional nitrogen increases the risk of developing decompression sickness at the end of the therapy especially if the chamber pressure is reduced too rapidly. In contrast, theoxygen compressed chamber will decrease the nitrogen concentration in the body and therefore allow for a safe decompression at any rate and any time during the therapy. As indicated above there are other significant differences affecting the choice of hyperbaric chamber. Air compressed chambers will have a hot and humid inside atmosphere during compression and will require thorough disinfection procedures to minimize risk of patient cross contamination. In contrast the oxygen compressed chamber will annihilate anaerobic bacteria inside the chamber during every therapy, to some degree a “self cleaning” process. Therapy sessions in air filled chambers are longer (approximately 2 hours) to include non-oxygen breathing periods during compression and decompression. They may also require more sessions to obtain results similar to those achieved with the oxygen compressed chamber. Air compressed chambers minimizes the use of oxygen but are, however, mechanically more complex given the requirement of external air compressors, backup units, air storage and safety systems. Furthermore, it is crucial for air compressed chamber installations to have a clean air supply and oil-free compressors with a reliable power source to deliver the pressure. Any pollutant in the air intake will be magnified by the higher pressure inside the chamber. When looking for hyperbaric services ask questions about equipment certifications, treatment protocols and personnel training. Local safety authorities will require Operational Licenses to be issue for individual chambers and facility installations. It is mandatory to have Operational Licenses on display at the facility similar to any applicable business licenses. Effective therapy requires daily sessions to initiate the body’s own healing response.